Steve Barsotti presents an evening of reduced listening, performing a work in three parts featuring improvisation with invented instruments and field recordings collected around the world over the past twenty years. 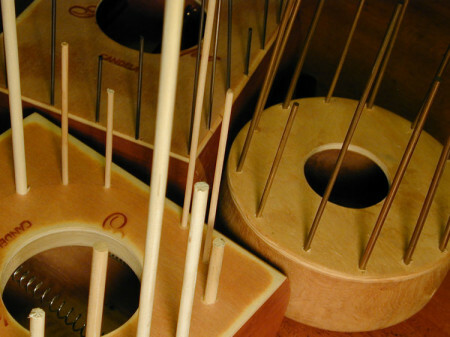 Barsotti will play his Spring Frame, a home-built instrument consisting of springs, strings, and other objects amplified through contact microphones. Joining him for a portion of the evening will be instrument inventor and percussionist Paul Kikuchi. Steve Barsotti is a Seattle-based improviser, sound artist, instrument inventor and educator. His work explores notions of reduced listening through close examinations of easily bypassed sonic details – sounds that can only be heard through contact microphones and amplification or the sonic qualities of materials and objects found in everyday life. He invites the listener to forgo an attempt at literal connections with the sounds and to focus on the sounds in and of themselves. His two solo CDs – Along These Lines and Say “tin-tah-pee-mic” – contain improvisations with object recordings, location recordings, phonography, and electro-acoustic processing. He also has an album with fellow instrument inventor Eric Leonardson, Rarebit, that features improvisations on invented instruments. His work has been described as “quite cinematic and unsettling,” and as “ushering the listener across an ambient divide”. He is an original member of the Seattle Phonographers Union, a group of improvising field recordists, and has been responsible for many of the group’s activities. The Union is described as “moving beyond habitual experience of sound and uncover what is foreign in the familiar and familiar about the foreign; to explore what we hear and relearn what we know.” They have been performing together for eight years.